Sometimes things just happen for a reason even if it takes 30 years. Case in point, The Emperors of Wyoming. Davis, a singer and songwriter, is talking to old band mate guitarist Frank Anderson: Hey, let’s make a country-rock record. A folk-rock record. Frank goes, Great idea, let’s go! Brother Pete goes, I’m in on bass. And Vig, living in L.A., just coming off a two-year stint producing Green Day goes, “Cool. Need some drums and stuff?” So there you have it. Back together again, for the first time. Only problem is, now the band members live in four different cities in two different states. No matter. Times have changed. All four have home studios. 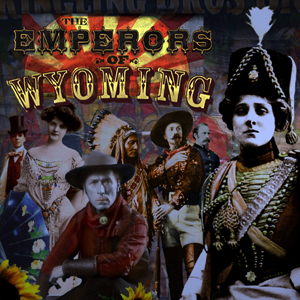 And so in 2011, two years later, through emailing ideas, songs, riffs, demos and mixes the Emperors of Wyoming is born and their masterful, eponymous debut, The Emperors of Wyoming, arrives. Under normal circumstances, that kind of distance and separation would be impossible. But of course, the Emperors all knew each from way back when, were old friends, and had played together in various combinations. So, no problem! In fact, this recording approach felt entirely natural and if anything brought them closer together, making the music even more distinctive and original. The result is an amazingly timeless debut record of American country folk-rock that bridges new and old, cutting edge technology and ancient instruments, spaghetti western, country-and-western, bluegrass, surf-rock, acoustic folk, hard rock, pop-metal, and pop-rock into a brand new American sound. A 10-song record with no filler, no gaps, that satisfies from the first track to the last. Yeah, it did take a long time to get here, but the Emperors of Wyoming wouldn’t have it any other way.